Indeed, the opportunity to encounter polar bear is one of the primary draw cards for many Owners wanting to head North. Having competent, and armed, specialists used to working in bear country is essential for the safety of a yacht’s Owner, guests or crew. For all of their beauty and magnificence, polar bears must be respected as the pinnacle predators in the Arctic. Unlike their brown cousins further south, polar bears are marine mammals and are most certainly at the top of their realm. Highly skilled hunters on land, ice or in water, polar bear have an uncanny ability to ‘appear’ out of nowhere. Polar bears need not be feared, but they must be absolutely respected and planned for. The first is having trained people onboard who know how bears operate and where they are likely to be found. Understanding polar bear biology and social habits can make finding them much easier, and when you do find them, a good naturalist will work hard to both maximize the opportunity for clients (without interfering with the bear) and also to minimize the chance of an interaction leading to harm (to either party). Secondly, having good deterrents can lead to a lot of peace of mind, and may save a life; either yours or the bears. The range of deterrents can be a little bewildering so it is important to have good advice on what is right for your expedition, and then to have the training in order to gain the level of proficiency needed to deploy them well. Finally, having a firearm (preferably two per group) offers a high degree of protection in the hands of a trained shooter. Indeed, in Svalbard it is not permitted to land outside of the townships without a high-caliber firearm. 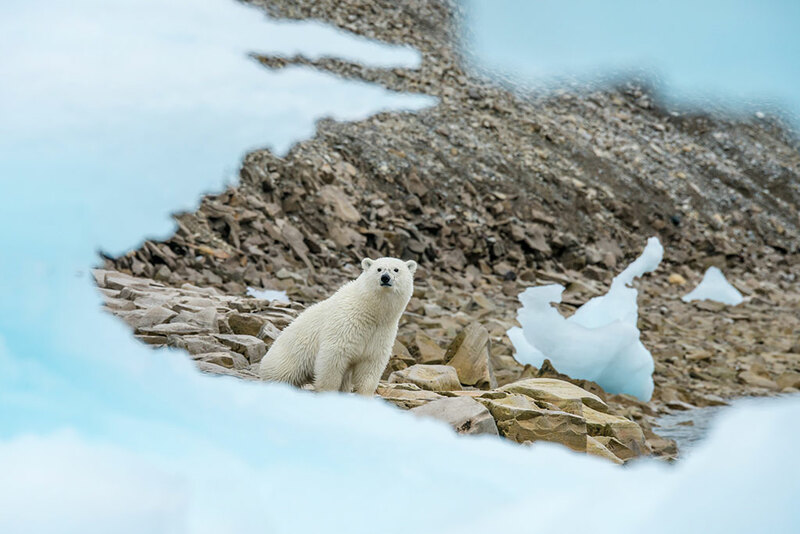 EYOS has a Bear Management ‘Standard Operating Procedure’ that sets out how we will manage encounters with polar bears, and how to avoid any encounter from becoming an interaction that could lead to harm to clients (or bears). We make this available to our clients wanting to tour the Arctic. Most Captains do not want the intensive paperwork incurred with the long-term presence of a firearm onboard, so our rental option is a common sense and popular one. When our staff arrive onboard, their experience and this equipment ensure that not only is the opportunity to find and film bears significantly enhanced, but that the interaction will be a safe one.